Head of Kherson Regional Council Vladyslav Manher has agreed on the amount of $5,600 with intermediaries Oleksiy Levin and Ihor Pavlovsky for organizing and committing an acid attack on activist Kateryna Handziuk, investigators say. Ukraine's Prosecutor General Yuriy Lutsenko told this to journalists on Monday, Ukrinform reports. "Manher has agreed with Levin and Pavlovsky on the amount of reward for committing this crime, part of which they planned to pass to organizers and executors, including at least $5,600 for the attack on Handziuk. Levin and Pavlovsky planned to leave the other part for their own enrichment," he said. Lutsenko said that it was established during the investigation that in early July 2018, Manher decided to take revenge on Handziuk for revealing statements about the unacceptability of forest arson, which was then used for personal enrichment by criminals operating in Kherson region with the assistance of local authorities and law enforcement agencies. "Due to the fact that Kateryna Handziuk held protests and published this information in the media and social networks, realizing that such criticism by Handziuk hinders his selfish interests, in order to intimidate people and activists of Kherson region who publicly criticized his actions along with Handziuk, [Manher] decided to organize the deliberate murder of Handziuk in a manner that would cause physical and moral suffering to the victim," Lutsenko said. According to him, in order to realize his plot, Manher turned to Levin and Pavlovsky and proposed that they find who who could kill Handziuk. "Pavlovsky and Levin agreed to this proposal by Manher. To fulfill this criminal order, he gave Levin and Pavlovsky at least 10,000 hryvnias for the purchase of means of communication and weapons to commit the murder," the prosecutor general said. According to the investigation, Pavlovsky and Levin involved Serhiy Torbin in organizing the assassination. The latter was informed about the plan to kill Handziuk, the methods of the attack, and the amount of remuneration. Torbin, in turn, involved his acquaintances Viktor Horbunov, Volodymyr Vasianovych and Viacheslav Vyshnevsky in committing the attack, Lutsenko said. He said that the culprits had tracked Handziuk's travel routes, purchased sulfuric acid, and created a closed group on the Internet for communication. Eventually, an assault on Handziuk was committed on July 31. "On August 4, Pavlovsky, with the knowledge of Levin, handed over at least $4,000 for committing the assassination attempt on Handziuk. Subsequently Torbin handed over $500 to each executor and used other funds from the amount at his own discretion," Lutsenko said. On February 11, Deputy Prosecutor General Yuriy Stoliarchuk notified Manher of the suspicion in organizing Handziuk's murder. A group of procedural heads of the Prosecutor General's Office and investigators of the Security Service of Ukraine left for Kherson to conduct investigative actions. Last week, the Kherson regional branch of the Batkivshchyna Party excluded Chairman of Kherson Regional Council Vladyslav Manher from the party. 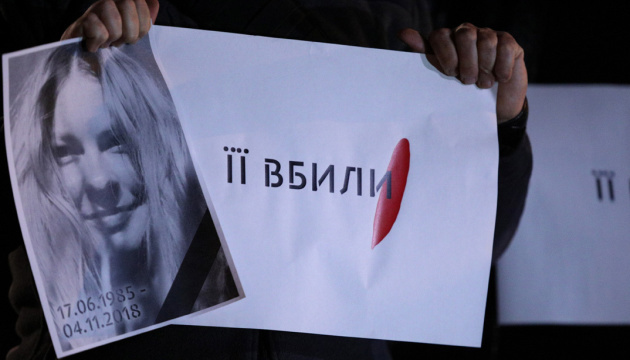 On January 31, Manher suspended his membership in the Batkivshchyna Party pending the investigation into the murder of activist Handziuk. Earlier, Handziuk's father, Viktor Handziuk, speaking at a meeting of the interim investigative commission of the Verkhovna Rada investigating the murder of his daughter, said that a suspect in organizing the assassination, crime lord Oleksiy Levin (Moskal), was cooperating with Manher and Chairman of Kherson Regional State Administration Andriy Hordeyev and his deputy, Yevhen Ryshchuk. Later, Hordeyev rejected the allegations of his involvement in the assassination of Handziuk and called on the prosecutor general, the SBU chief and the interior minister to verify the facts set forth in the appeal of Handziuk's father, and if they turn out to be false, to find those who urged Handziuk's father to make an "information provocation." An employee of Kherson City Council, activist Kateryna Handziuk, was attacked with sulfuric acid on July 31, 2018. She sustained chemical burns and partly lost her eyesight. Handziuk underwent over ten operations. She died on November 4. The same day, investigators re-qualified the attack on her to "intentional murder committed for mercenary motives, with special cruelty, a contract killing committed on prior collusion by a group of persons." Five people were detained on suspicion of organizing the attack on Handziuk. It emerged on November 12, 2018, that Ihor Pavlovsky, a former aide to MP Mykola Palamarchuk, had been arrested as part of this case.